In my home state of Pennsylvania, so many anglers flock to area lakes seeking crappies in the spring that on pleasant weather weekends it is usually impossible to find a parking place at any boat ramp! However, by the 4th of July, most of these anglers have disappeared – seemingly forgetting about crappies until next spring. But their loss is our gain. For those of us who never hang up the rod, it sure makes life on the lake a lot less crowded! 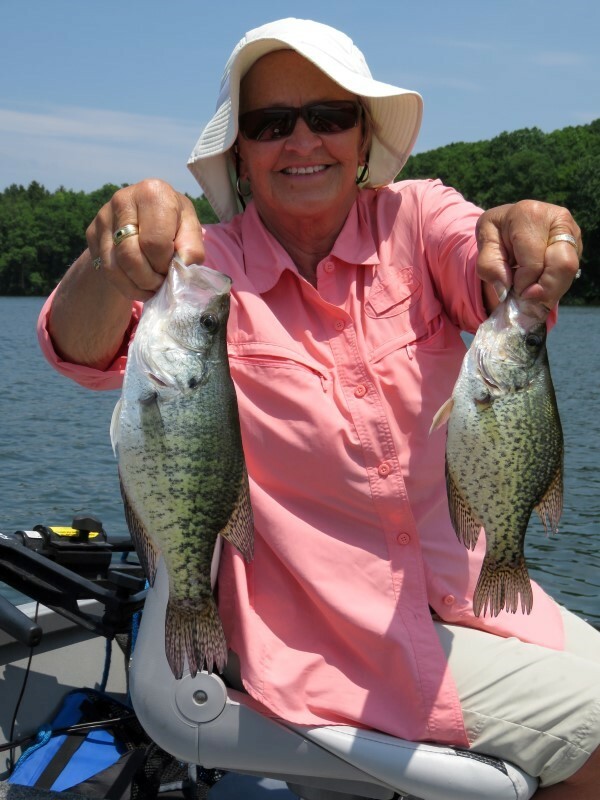 Now is the time crappie anglers can reap mid-summer rewards on waters in northern states. Depending on the type of lake, water color and primary food source, northern crappies can be found in a variety of locations in the summer – from the shallows to deep structure and everywhere in between. Therefore a variety of angling techniques can be applied depending on likely fish location. I’m a single pole guy at heart – I don’t get excited about pushing or trolling. If I can reach active crappies by casting or dipping, that’s what I’ll be doing. 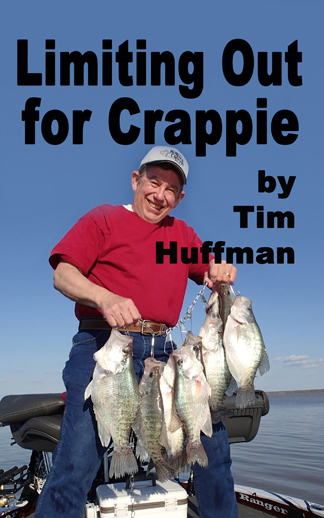 With that in mind, here are my tips to sizzling summer crappies. 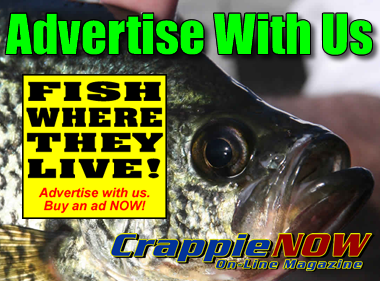 I select lakes or areas of a lake where I expect to encounter actively feeding crappies on deep weedlines, stump-laden points/shallow flats or shallow brushpiles/cribs – in depths from two to 10 feet. 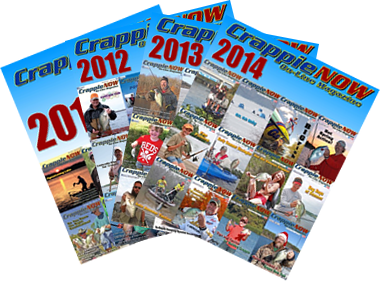 How do you know which waters in your region are going to have relatively shallow crappies during the summer? Well if you don’t have a good fishin’ buddy who will share the info, then you need to get out for a little field work. By choosing shallow cover carefully, you can cast your way to summer crappie success. For a starting point, check the weeds. 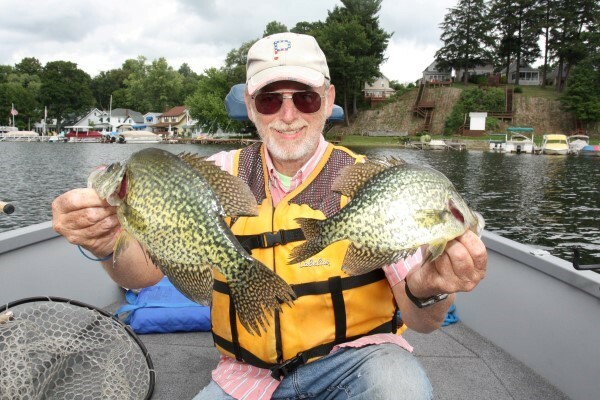 Every natural lake (whether clear or somewhat stained) in my region will have black crappies working the edge of a deep weed wall or sparse weedy flats throughout the summer. Many of the area’s shallower man-made reservoirs will have some milfoil weeds too, and crappies will generally relate to these vegetation beds as well. Also, on man-made reservoirs, check the shoreline deadfalls which extend furthest into the water on moderate steep banks. Deadfalls with multiple branches are usually better, but do not overlook those old no-branch deadfalls with only a “Y” fork in the trunk. If the shoreline landscape (large trees, moderate incline) indicates the likelihood of some large “spider” stumps in the shallow water, be sure to check the water out from shore for a ways for these gems. Finally, it’s time for serious detective work with your sonar to locate moderately shallow cribs and brushpiles. Here is where side-scan technology pays off big time to check points and shallow flats. Mark each one you find whether you see fish on it at the time or not; crappies will likely be on the cover sometime in the future. Okay, you have some ideas on where to cast. Now we turn attention to what to cast. Generally speaking, larger baits may be used in the summer, especially as the schools of baitfish continue to grow in size. In the spring I would likely be slinging a 1/16-ounce leadhead with a 1.5” to 2” body. But come summer it’s time for an upgrade to 1/8 or 3/16-ounce head with a 2” to 3” body – or bigger! Years of shallow-water largemouth fishing have clearly demonstrated to me that a decent-size crappie has no problem inhaling a 1/4-oz. leadhead with a four-inch grub or even a small willow leaf spinnerbait, so I always have some of these larger baits. Granted, smaller bodies will likely catch more crappies, but larger bodies will catch bigger crappies. Pick up the most aggressive fish on the initial pass; then go back through with smaller baits if you wish. During the summer, I believe in presenting a plastic body/leadhead that has a lively action when swimming through the water. I go with either a curly tail or shad tail body. Among the ones I use most often are the Kalin 3” Lunker Grub, Charlie Brewer Slider 2-1/8” Minnow, Gene Larew 3” Long John Minnow (pinching off about 1/2″), Bobby Garland 2” Swimmin’ Minnow, plus 2.5” generic shad-shaped body. These are mated to 1/8 or 3/16-ounce heads. When casting over and around thick weedbeds in clear water, I often rig a slender Bobby Garland 2” Swimmin’ Minnow weedless on a Slider Spider Head. The cone shaped head and offset hook shank allows the long slender Minnow to be rigged Tex-posed making it very fishable around vegetation. 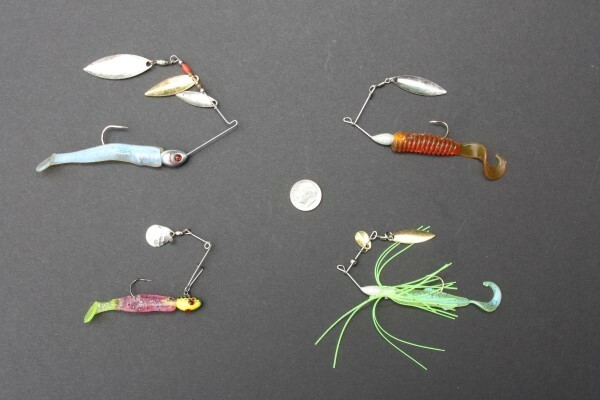 Selection of small spinnerbaits, including three hand-crafted ones plus a 3/16-ounce Booyah Willow Spin. 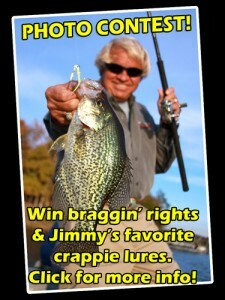 In terms of a spinnerbait, you might be surprised just how big a spinnerbait that a crappie will hit. One day I caught four oversized Shenango Lake crappies on a 3/8-ounce double willow while fishing for bass. However, when actually targeting crappies with a spinnerbait, I intentionally downsize. Booyah offers a 3/16-ounce willow-leaf spinnerbait which works well; I remove the skirt and place a shad body on it. You can make miniature spinnerbaits with a jig and a safety-pin overhead spinner, creating a lure similar to a Beetle Spin – except I use an action-tail grub body on it instead of the Beetle. This past winter, a tackle-crafting buddy made several crappie-size spinnerbaits for me to try. I am looking forward to giving them a work out. Because I am searching for crappies which are in a more aggressive mood, I don’t take a lot of time to really fine-tune colors. For clear water, I like normal minnow/shad colors, along with smoke and clear sparkle. For slightly stained to somewhat dingy water, I rely more on baits with a watermelon, reddish, blueish or white main body and a chartreuse tail. If the grub does not have a chartreuse tail, I use Spike It dye to create one. For post heavy rainstorm conditions when water is downright coffee-with-double cream muddy, I prefer to stay home. If I must fish, then I stick with all black or all white tail dyed orange – and hope for the best! Now it’s time to Go Fish!